For every few steps forward against racial prejudice, we take a step back, which is why the socially conscious St. Thomas Playhouse Summer Theater Project attempts to use the lazy days of summer to revive shows to bait the dialogue. This year’s show, “South Pacific,” will be held Wednesday, June 18, through Saturday, June 21, at the Community School Theater in Sun Valley. Kevin Wade directs, R.L Rowsey directs the music and Peter Burke and Sara Gorby choreograph. The young cast includes Brooke Allen, Jamie Moore, Drew Morse, Spenser Pfau and Sam Brown. The genius musical-theater partnership of Rogers and Hammerstein first presented “South Pacific” four years after the end of World War II. The story is set in a time when America, jubilant to have prevailed and have soldiers home, was still grieving the loss of so many fine young men who never returned to their loved ones. Rogers and Hammerstein adapted their own plot, based on “Tales of the South Pacific” by James Michener, which revolves around a Polynesian island where numerous Seabees, Marines, officers and nurses are stationed during the thick of the war. Ensign Nellie Forbush has met a mysterious French planter, Emile de Becque, and both find themselves falling in love. However when Emile confesses that he was married to a Polynesian woman and that they had two children, Nellie lets racial prejudice overtake her and she breaks off the relationship. Meanwhile, the Seabees, led by Luther Billis, are doing their best to bide their time as the war rages around the island. Billis attempts to make some money in the souvenir business, but a formidable Tokinese woman called Bloody Mary constantly outwits him with her own thriving business. A young lieutenant named Joe Cable arrives on the island, and Bloody Mary, sensing that he comes from a wealthy family, lures him to her special island, Bali Hai, where her beautiful young daughter Liat lives. Cable falls hopelessly in love with the Polynesian girl, but realizes that his family will reject her due to racial prejudice. The heartbroken Cable and de Becque volunteer for an extremely dangerous spy mission on another island occupied by the Japanese. Cable is killed but Emile makes it back to the base where Nellie realizes that her old prejudices are incomprehensible in the face of true love. She and Emile reunite and she embraces his children. Rogers and Hammerstein had a brilliantly wove moral lessons in their shows. Certainly South Pacific has strong messages about racial prejudice, the horrible costs of war and the true power of love. 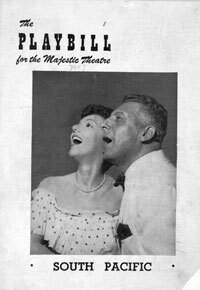 At the time, during the 1940s and 1950s, those topics were taboo, but through their story, which is filled with humor as well as drama, those moral issues were brought into the open. The musical resounds strongly today and touches our hearts. The songs, every one of them famous, range from passionate love songs to those that are silly and fun. Rowsey said he is excited about the show for a number of reasons. Rowsey described director Wade as a genius. “He works with teens in a way that overwhelms me,” Rowsey said. “I taught Kevin when he was a teen and now I feel like I’m sitting in a master class at every rehearsal. He never scolds teens for being teens—for responding to a situation as a teen. Instead, he honors it, acknowledges it, and uses it to move the work forward. What a gift it is for me to get to work side by side with the great guy. Once student and teacher, now peers. The show will begin at 7:30 p.m., and it is strongly recommended to buy tickets in advance. Tickets are available by calling St. Thomas Playhouse ticket line at 726-5349, ext. 15 or at Iconoclast Books on Sun Valley Road. Cost: Tickets for adults are $20, youth (13-18 years) $15 and children 12 and under $10. When: June 18-21. Doors open at 7 p.m.
How: St. Thomas Playhouse ticket line at 726-5349, ext. 15 or at Iconoclast Books on Sun Valley Road or at the door at the Community School Theater in Sun Valley.